For an implant to become permanently stable, the body must grow bone to the surface of the implant. This process is called osseointegration. Osseointegration is defined as the formation of a direct interface between an implant and bone, without intervening soft tissue. Applied to oral implantology, this means that the bone grows right up to the implant surface without interposed soft tissue layer. For osseointegrated dental implants, metallic, ceramic (zirconia), and polymeric materials have been used, in particular, titanium. Up to this day, titanium is the most favored material due to its great ability to make a connection of its surface with the alveolar bone. 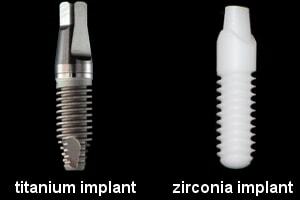 However, zirconium dental implants have lately emerged. Even though they are relatively new, there has been a considerable increase in the use of these types of implants. Loading time refers to when are the artificial teeth attached to the implants. Generally speaking, osseointegration can be damaged by prolonged adverse stimuli and overload, which may result in implant failure. Immediate loading means that the artificial abutments and (sometimes) the prosthetic restoration are attached to the implants during the surgical placement procedure (or immediately after). This relatively new approach aims to shorten treatment time. Followers suggest that the initial stability of the implant in bone is a more important determinant of success of implant integration, rather than a certain period of healing time. Early loading means that abutments and artificial teeth are attached to the implants one to twelve weeks after surgery. These two loading methods have certain limitations. Even in the event of early or immediate loading, many practitioners prefer to place temporary restorations for a certain period of time. Once the implants have had a chance to heal and have been tested for successful integration, the definitive restoration is manufactured. This is the most prudent approach ; three to six months of integrating time (depending on various factors) is allowed before placing the teeth on implants. 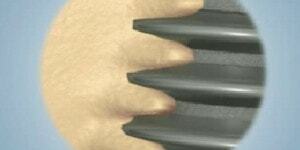 Before connecting the artificial abutments, the implants are tested for successful osseointegration. The fact is that the degree of osseointegration of implants is a matter of time. While first evidence of integration occurs after a few weeks, the more robust connection is progressively effected over the next months or years. This means that the osseointegration process continues well after the definitive restoration is secured to the implants. That is just one reason why the prosthetic phase requires an equal amount of technical expertise : a restoration that overloads one (or more) implants can damage the osseointegration process, which may result in implant failure.